RoboRaid is probably one of the best games to really show how can Microsoft HoloLens can revolutionize the first-person shooter genre. The game produces a mixed-reality experience where your enemies emerge from within the boundaries of your room, or whenever you decide to play it. So unlike a Virtual Reality game where everything takes place in a virtual space that totally replaces your field of view, the game uses the physical environment as the base level of the action. So this means that there each different room you play the game or different furniture arrangement, the game takes a different shape, and reconstructs itself to fit the new environment it takes place in. Like it is written on Microsoft's website: "Your room is the battlefield". That phrase implies several things. First of all, the enemies can spawn in any direction all around you, all within the boundaries of your room. 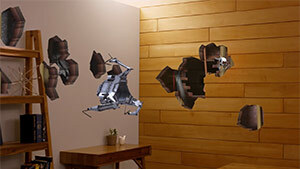 Second, destruction is simulated by overlaying transparent images on top of your actual walls that shows the shooting damage. All the sound and graphics effects feel more real and alive due to the mixture of digital and real physical objects around you. So a very boring afternoon can turn into a very enjoyable one, just put the HoloLens headset on and start having fun. Microsoft calls it "A True first-person shooter. ", and I can definitely relate to that. First of all, all the games for holo-lens are viewed in first-person. This is because instead of a 3D camera that directs your POV, like in VR or a traditional 3D game with a monitor, you use your eyes. The use of Spatial sound and the fact that the HoloLens is an untethered and works without any wires, also contribute to a better immersion and playing an FPS feels more natural to play. RoboRaid is the first mixed-reality FPS game. In every room you play, the experience is going to be different. The is no need to develop unique levels; in fact, your are the one who is designing the levels and the HoloLens adapt to the environment changes that you've made. Games like RoboRaid really reminds me watching a film with live action animation like 'Who Frames Roger Rabbit', a movie from 1988. RoboRaid is one of those mix-reality games that will change they way we gamers play games in the future and will introduce to you a new unique FPS gameplay experience that is already making people in the gaming industry very, and I mean, Very impressed. If you are an FPS game fan, this is probably the first game you need to try out once you get your hands on the HoloLens HMD.